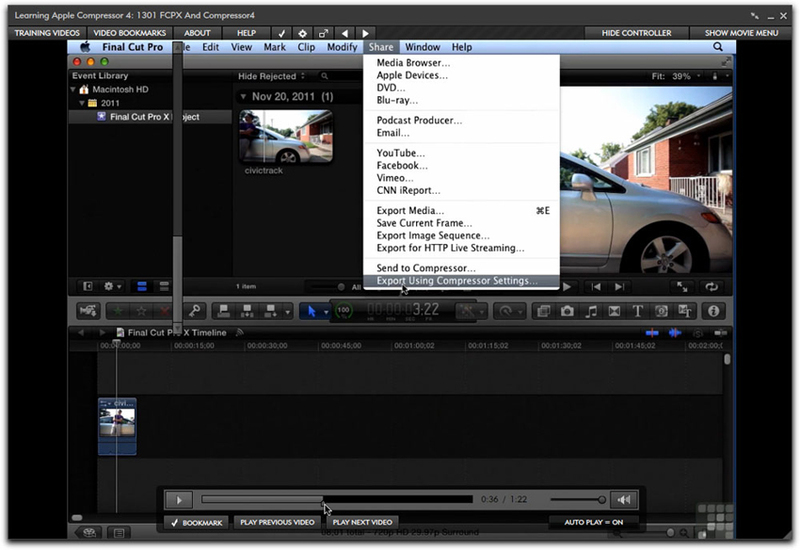 This newly released tutorial DVD produced by Infinite Skills is designed for both the new user as well as users of legacy versions of Final Cut Studio. 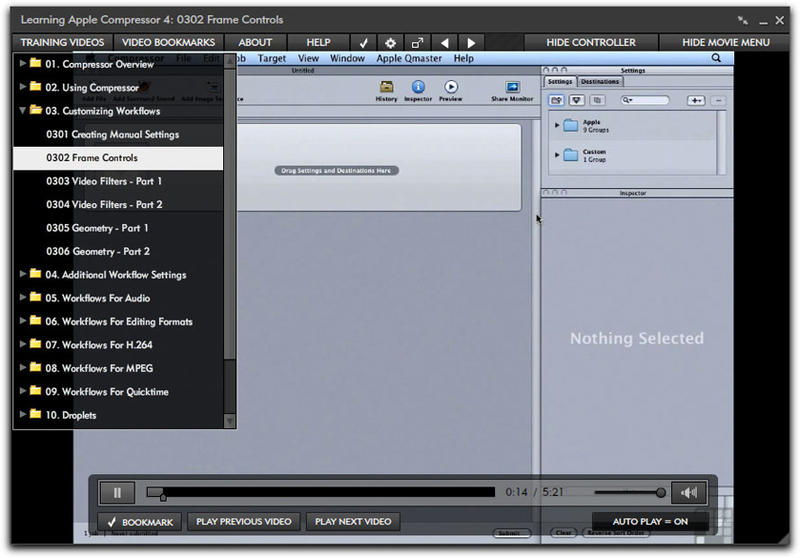 The 2.5 hours of tutorials are viewed on Infinite Skills' Video PlayerMac, a viewing application that runs off your Mac's drive. The production quality both in the video and audio realms are top notch, easy to view and hear and do not have narrator hems and haws as several tutorial DVDs I have seen and heard in the past. 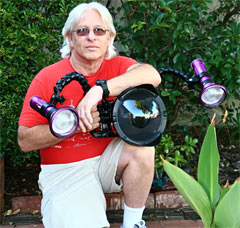 Anyone looking at YouTube tutorials regarding Compressor or Final Cut Pro can attest to the varying qualities of YouTube tutorials. In those, often the 'at home' instructor corrects themselves after making errors, makes the viewing palate difficult to see and sometimes just does it wrong. 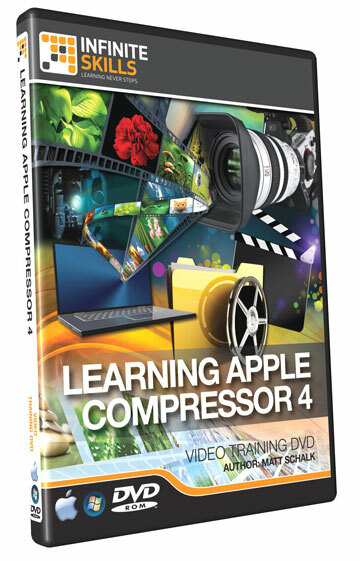 Not here; in Learning Apple Compressor 4, we have a professionally produced DVD that is well within a reasonable price for purchase. Using Infinite Skills' own Video Player Mac viewing application, you utilize a viewing window showing the different lessons. This viewer runs off the disc so you do not need to copy over and install the application itself. All media materials are supplied on the DVD which you can copy over to your hard drive allowing you to work with the instructor as he walks you through the various lessons. As with other discs by Infinite Skills, you cannot use the J,K, and L keys to fast forward or reverse but I found it easy to grab the progress cursor to drag forward or back within the controls window at the bottom of the screen. This control window only becomes visible when you bring your cursor to the lower part of the window. In addition to the progress cursor, this window also contains the 'play previous video' and 'play next video' choices as well as a box to bookmark any chapter that you felt you might want to revisit. Along with the appearing/disappearing stop/start window at the bottom, should you bring your cursor to the left side of the screen you can then view the different chapters and their scroll down arrows to see the many subchapters in each. The lessons chapters on the left and video controls at the bottom. You can also go full screen if you want but I had to quit the Infinite Skills disc completely in order to get back to normal screen size. Unless you go full screen, it is easy to drag the corners to adjust the viewing screen to a smaller or larger screen. A full menu of material is covered in the syllabus by Matt Schalk. He presents the material free of errors that I could see and each lesson is well thought out, sequential and nicely planned. While there is a basic introduction chapter for those new to Compressor, I was hoping some time would be set aside to point out the differences between Compressor 3 and 4. Though the disc cover does state that this DVD is meant for beginners, in truth, most editors using Compressor 4 have probably used previous versions as well, and might very well have wanted the differences explained up front. This is also the reason why I disagree that this DVD is meant for beginners. Matt uses all the correct terminology and lexicon that we have all grown used to and learned over the years, however, if this were truly meant for beginners, more time would have been spent explaining what many of the terms used actually meant. He doesn't. I don't blame him, most of us have taken what we have learned and taken it for granted. However, the true beginner does not have that luxury. When Matt uses such basic terms as progressive, and deinterlacing, and discusses the use of frame controls and geometry in the inspector, I question whether the beginner would know what he is talking about. No explanations are given for what these things actually do which leaves the new user to simply follow steps without understanding the 'Why?' of the matter. Even there, I found Matt's narration to be sometimes vague with a 'you May do this, or May do that'. The beginner is looking for real step by step directions along with explanations for the 'Why' of the matter. Ambiguity does not bode well for beginners. That aside, the well thought out chapters discuss most of the ways to create files for just about every Apple device you can think of, though how to create files for uploading to YouTube or Vimeo, something I am often asked and have written on, is not attended to. While I caught no mention of using Compressor relating to standard DVD creation, other than Blu-ray, which he does discuss, the last chapter on sharing FCP X and Motion with Compressor 4 were quite welcome. It might sound as if I am being critical of this DVD tutorial but, if you are already an experienced user of past Compressor versions, you may very well pick up some neat approaches to using Compressor 4. If you really are new to Compressor as an application, you may have to revisit some chapters multiple times in order for you to 'get it'. Then again, I do that all the time.